This prevents use of VS 2013 in many organizations where corporate policy forbids IE10. In practice, the VS 2013 installer just checks one registry value for IE10 presence, Visual Studio 2013 IDE doesn’t check for IE10 and at the moment I’m not aware of a single VS scenario that fails without IE10. Thus we can install and use VS 2013 without IE10 with a simple registry modification. HKEY_LOCAL_MACHINE\SOFTWARE\Wow6432Node\Microsoft\Internet Explorer on 64-bit Windows (originally described by Jimmy). Any value >= 10.0.0.0 makes the installer happy. 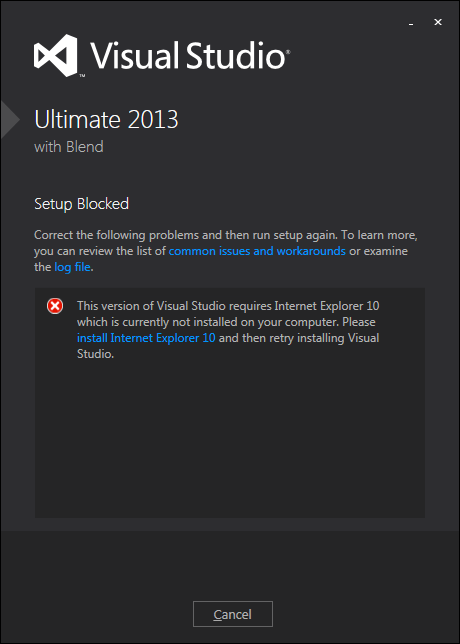 The VS 2013 installer checks for IE10 at the very beginning. So, the registry modification timing is following: change registry, run the VS 2013 installer, when the first setup dialog appears (see the following screenshot) revert registry changes. In this case the IE10 version string is present for only about a minute in the registry. 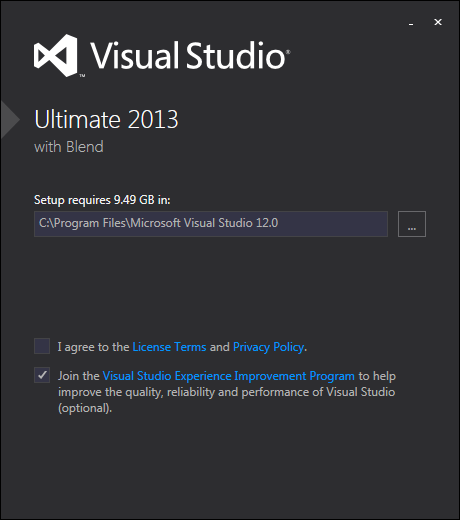 Wait for the installer to complete and run Visual Studio! Update: Steve Teixeira from the Visual Studio Team listed VS 2013 components that require IE10 and promised to investigate support for customers installing and running VS 2013 on machines without IE10. Update 2: Visual Studio 2013 installers were updated to enable VS 2013 to be installed on Windows 7 machines running IE8 or IE9. See details here. Thanks for giving me credit and I hate that you have to explain it so simply that way others can understand how to apply the fix. Did you happen to see what the VS Team posted? I think we finally got Microsoft’s attention with forcing IE10 on developers. I really hope they remove it. Yes, I’ve added the link to the VS team status update. Thank you very much for this work-around.